Hey guys! 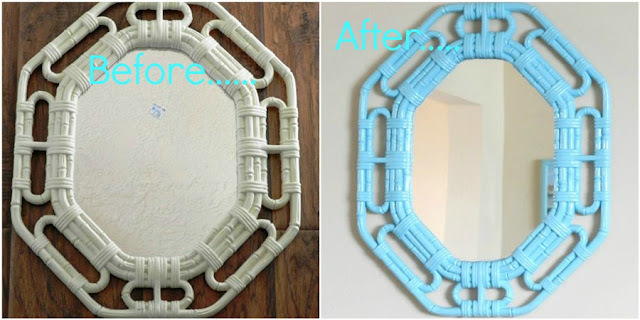 I have a fun post up today that I originally guest posted at Chic On A ShoeString Decorating a few weeks ago. Here's a little before and after thrift store find. Check out this mirror I found for $2! Ha! So cute! I love the new color. I'm visiting you today from Sugar Bee Crafts. I co-host a Linky Party Tuesday (open thru Sat). I hope you get a chance to stop by my blog, leave a comment and Link Up, too! Haha! So cute, amazing what some paint can do! That's hysterical (the mustache part)! But the mirror looks awesome! Major score! I would pay WAY more than $2 for that baby! I love this! I have a similar mirror (unfortunately not the same great shape) that I want to paint exactly the same way. Great job!